Oh, the bliss of a lie in with nowhere to go and no reason to get out of bed. For the first time since we arrived, everyone managed to sleep as long as our bodies wanted, with no one of us intentionally waking any of the others. This is what the holiday is all about and I think the doctor will recommend many more mornings like this one. To yet further increase the enjoyment of the day for me and Sandy, we decided to ditch the kids and head out for the morning for a bit of ‘us’ time. Neither of the kids wanted to leave the house with us as we went out for what ended up being a brunch. Oh well, that was their choice. Me and Sandy left them at the house. They both had their mobile phones, iPads, LEGO and so on to keep them occupied and in touch with us if need be. Sandy and I loaded ourselves into the car and we were off. I had a hankering for those chicken tenders tossed in buffalo wing sauce that I had at Denny’s a few nights ago so I was keen to seek that out again. On a whim – Sandy’s in fact – we set off in a different direction this time. We had a bit of a bet in the car as to whether we would encounter a Waffle House in the direction we were going. I was pretty sure we wouldn’t and so had no hesitation taking on Sandy’s $10 bet that we would. Alas, I lost the bet. Sandy erupted into an exuberant happy dance of jubilation when she spotted the yellow sign in the distance along SR 27. Evidently, she had remembered seeing it when the satnav actually took us this way a few days ago but I had forgotten about it. Cheater! Along with the Waffle House, we found the Denny’s also. Restaurants tend to all cluster together here in Florida, so when you spot one you’re much more likely to spot many. We stopped and had a lovely relaxing brunch together. While waiting for our order, we checked out what else was in the immediate vicinity. Jennifer has been asking for some months now for a GoPro. Just around the corner from us was a Target, which does sell them, so we resolved to pop in and check out whether they had any in stock. We took our time with the brunch but Eventually hobbled out of the restaurant having eaten well. We have a Disney character meal on the agenda for later this evening and so would probably skip lunch altogether. The dining reservation was originally for the Garden Grill in EPCOT, which is where Chip and Dale come out to the tables. When we checked the Disney app on the smartphone this morning, we realised that there was probably going to be very little from the a la cart menu that we or the kids would eat. At $50 per person, it gave us serious pause for thought as to whether it would be a good use of our daily budget. Since we also had a character dining reservation at Crystal Palace in the Magic Kingdom, and that’s a buffet, we decided to switch the reservations around. You have to cancel a reservation within 24 hours of allotted time, so I had to call the Disney Dining hotline to swap them around. Otherwise, I ran the risk of a $10/person cancellation fee being applied to my credit card. 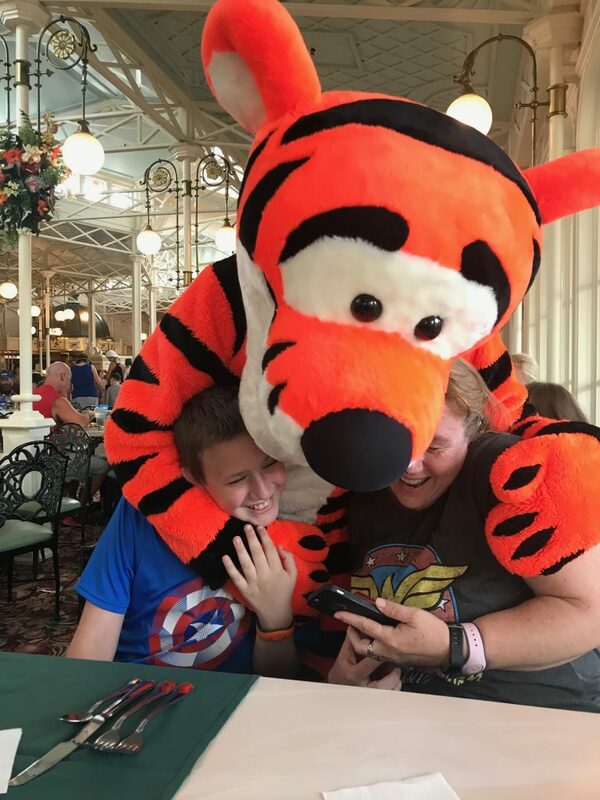 I had originally organised four character dining reservations – one in each of the main parks. In all likelihood, we will cancel the Garden Grill reservation altogether. 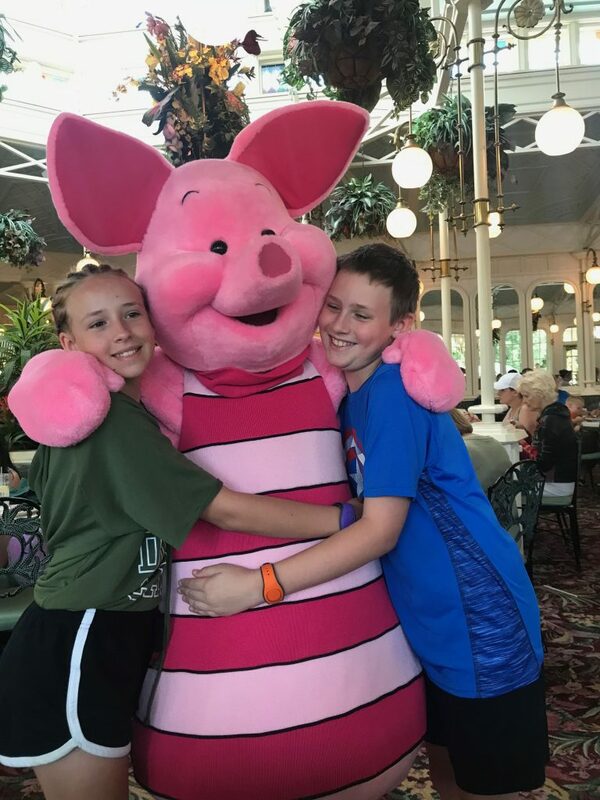 Between the Tusker House character dining in Animal Kingdome from the other day and what will now be Crystal Palace at Magic Kingdom today, we will have reached our goal of giving that experience to the kids and so will probably call it ‘achieved’ and save a bit of money. That being said, we still haven’t decided which way we’ll go with the Hollywood and Vine character dining reservation at Hollywood Studios. That will cost us $212 (excluding tip). We’ll make a call on that one in a few days’ time as that’s not until next week. We drove the short distance over to where Target and a range of other department stores were. When we got there, the true nature of Sandy’s deception was finally laid bare. She knew it all along. Her insistence that we head off in this direction this morning wasn’t just the ‘whim’ I was mistakenly led to believe after all. Indeed, I now realise there was much deception and skulduggery involved. It was no accident we arrived here at this place this morning – and with no kids at that. We entered the car park and her eyes lit up like a Christmas tree. She was focused – nay, possessed. I could sense the retail neurons in her brain (which by now had swelled to occupy well over 80% of her cranial cavity) had all fired simultaneously. There it was. The one shop she had so often visited when we lived here previously. That one place that would swallow her whole and keep her there for hours on end. It was Michaels, an arts and crafts store. As I parked the car, I tried to talk to her. There was no response. It was too late. She was already too far gone. The vortex had sucked her in, and she had already passed through the event horizon. She was by now salivating from the corners of her mouth. I knew I’d be safe if I kept my arms and feet away from her mouth and didn’t impede her progress as she got out of the car and drifted effortlessly, as if on a cloud of air, towards the front doors to the store. Before I knew it, she was gone. I sat there momentarily, contemplating how long she’d be in there and what might happen in that time. What would I look like when she returned? What sort of person would I be? What sort of university would my grandkids have graduated from? How would the planet’s biome have changed? Would we be able to afford to eat ever again? I tried not to think about it and instead wandered over to a few other stores to busy myself for the long wait. Sandy did eventually emerge from Michaels. It wasn’t of her own doing. I had to go in and ‘rescue’ her from herself. She did eventually agree to leave the store, although our relationship might never be the same again now. This will take a lot of recovering from, but our marriage is strong. I have high hopes it will survive…eventually. We did pop in to the nearby Target, but their stock of GoPro cameras was very limited. We also popped in to a shoe store and a few other places. It was good therapy and did wonders to ween Sandy off the upsetting thoughts of having to leave Michaels. In the event, we did both end up buying something in one particular store. Sandy bought herself a new bumbag (fanny pack) and I got myself a new leather wallet – one that is long enough to accommodate banknotes without having to fold them first. We made our way back to the house sometime after one O’clock or thereabouts. We had spoken to both kids by mobile a couple of times throughout the course of the day already, so we knew they were OK and hadn’t murdered each other…yet. When we walked in, Jennifer was still buried in her iPad and Joey had made a start on his new BB-8 LEGO set I had bought him a couple of days ago. It’s a large set with over 1,100 pieces sorted into about eight bags. One of those bags contained a mini BB-8 character, which Joey just absolutely had to get his hands on come hell or high water. In his haste to find it, he opened ALL the bags of LEGO…onto the same pile on the floor. Consequently, it’s now much harder to find the piece he needs because everything is just one big jumble. I pointed this error out to him, but of course he didn’t care one iota. He always has difficulty seeing much farther than his nose. With the new plans to visit the Magic Kingdom for dinner, we packed our bags and organised ourselves accordingly. 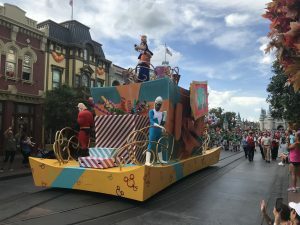 The usual routine of the car to the theme park parking lot and then in to the park is slightly different for the Magic Kingdom. It’s a much bigger theme park than all the others. Once the car is parked, the tram takes you to a transfer station, where you have to catch either the monorail or a ferry to the park’s main entrance. Largely influenced by Joey’s anxiety about being on the water, we elected for the monorail, although Jennifer and I will likely take the ferry back – just so we can experience both options. With no rides or other attractions planned just yet, we went straight to the Crystal Palace dining hall. I registered our arrival with the cast member at the podium, and she took my mobile number, so they could SMS me when our table was ready. Pretty much instantly, Jennifer and I got separated from Joey and Sandy. It turned out they had found their way inside into the much more comfortable air-conditioned environment. We found them a short while there after, albeit only after I had to call Sandy on her mobile to find out where she was hiding. I eventually received the text message, but they still called about a dozen other names ahead of ours over the course of the next ten minutes. Once inside, we were assigned our table, given our drinks and invited to get some food from the buffet. 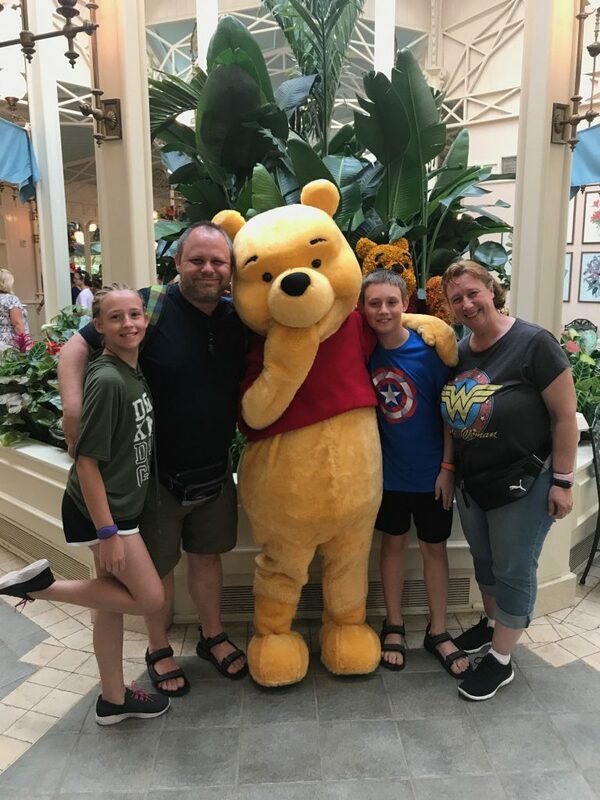 It was explained that it can take up to ninety-minutes for all of the Winney the Pooh characters to complete a single circuit around the dining hall. The food was very good, although I have to say that the choice and variety was much more limited than I had hoped for or remembered from the previous time we were here. For just the food, it was probably a lot more expensive than it should have been, but it’s not just about the food. 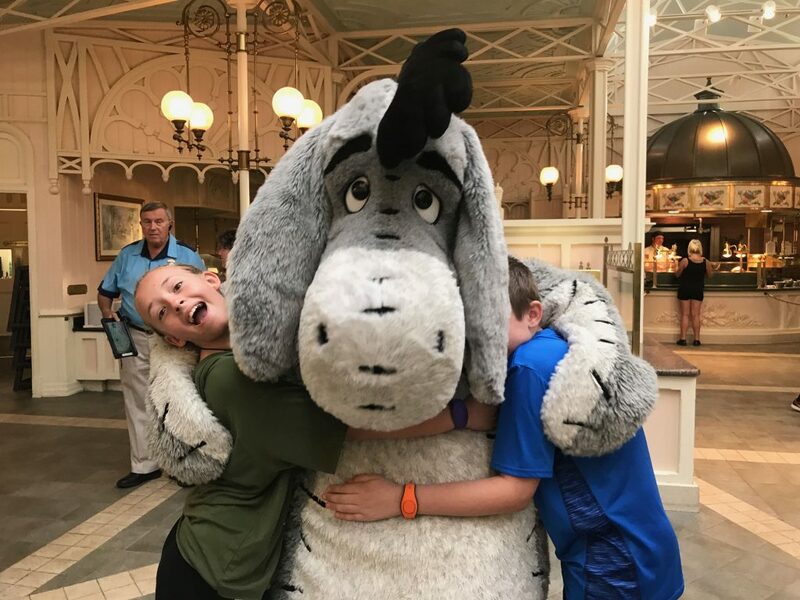 The smiles on the kids’ faces – Joey’s in particular – when the characters came to the table was certainly worth the cost of admission. 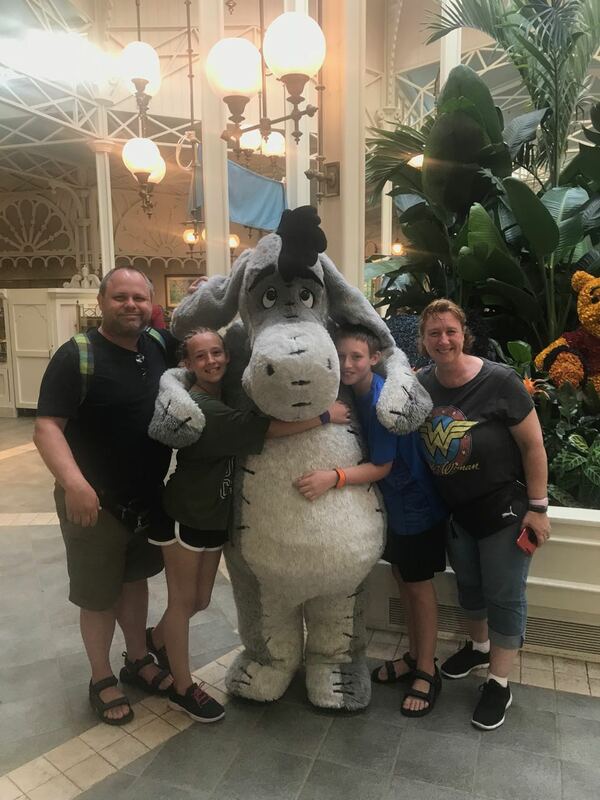 Over the course of the hour we were there, we saw all but Eeyore, who had just passed our table when we first took our seats. Sandy mentioned this to one of the cast members. They were really great and made a special arrangement for Eyeore and Pooh to stop and say hi to us as we waited by the flower arrangement by the front door just before we left. That was a nice touch, Disney. Well-played. Having eaten our fill, we wandered over to Tomorrowland, where Sandy and Joey would do the Buzz Lightyear Space Ranger Spin ride. Jennifer and I went to get a DAS return time for Space Mountain. They gave us a time forty-five minutes hence and so we went off to join Sandy and Joey. We stopped at the restrooms on the way, so by the time we got there, they had already gone in to the ride. We did try to get in but didn’t make it in time and found them at the exit instead. Sandy was a little annoyed with me. It was indeed all my fault…it always is. I’m not exactly sure what the fault was but I accepted my fate all the same. So as to allow time for the frustrations to die down a bit, Jennifer and I went off to do something while Sandy took Joey off to do something else. We went to the Space Mountain fastpass queue, since our return time was approaching. As it happened, there was quite a queue of people waiting to go through the fastpass line, but it was at least moving quickly. We arrived at the front of the line a couple of minutes before our time, but they let us in all the same. Even though we went through the fastpass entrance, it still took us about ten minutes of walking through the tunnels before we were finally able to ride. All the while, we walked passed what seemed like a static queue of people on the other side of the divider. Those were the mere mortals that were in the standby line. It made me realise just how fortunate we have been with the access we’ve had to the fastpass lines throughout our stay here. I shudder to think how much our enjoyment of this holiday would otherwise have been impeded. Jennifer absolutely loved Space Mountain. We exited and made our way to the Monster’s Inc. Laugh Floor, which was where Sandy’s SMS had directed me to. Try as we might, we just couldn’t meet up in time, so Jennifer and I had to wait for the next four hundred and fifty or so audience members to move into the auditorium for the next showing. When the doors finally opened, we found Sandy and Joey hanging back from the previous performance. Joey was jumping up and down and grinning from ear to ear. He had evidently enjoyed the show so much that this was now going to be the second time they had hung back to watch the show again. With Joey in an uncharacteristically good mood for this time of the night, we left the laugh floor auditorium with the rest of the sheeple and made our way out into the dusk. 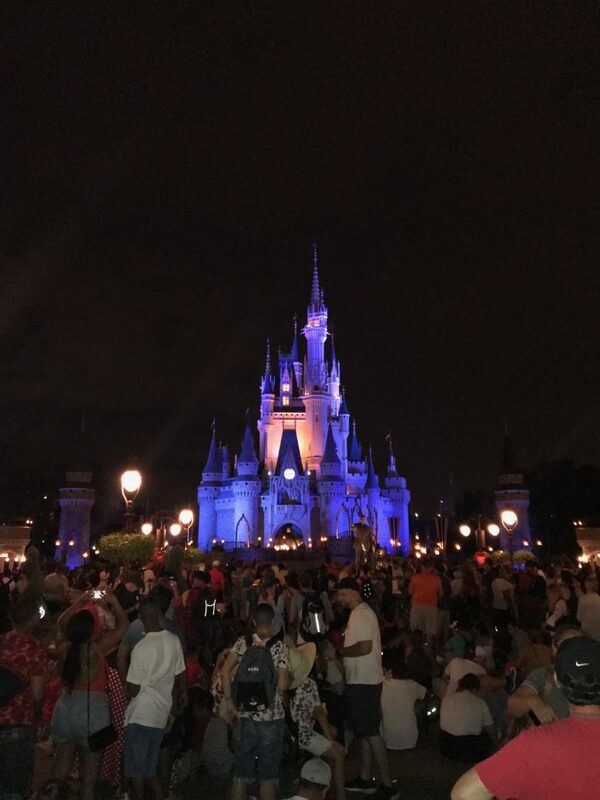 Even though today wasn’t a very busy one by Magic Kingdom standards, we were just a half hour away from the nightly laser and fireworks show. There was standing room only in just about every direction you could walk. Concerned that Joey wouldn’t tolerate the loud fireworks bangs very well, Sandy decided to take him back to the car via the monorail. Jennifer and I hung back for the show. We made our way to near the front of the castle and took up a very nice vantage point while we waited. Unfortunately, a cast member came through after a while and asked that everyone move forward and also to clear the rail tracks so as to make a path for those wanting to move towards the park exit. We ended up shifting around several times. Each time we did, we found our view had worsened. Worse still, there was lightning illuminating the castle every few minutes. About ten minutes before the show was due to start, there was an announcement. The show would be delayed due to inclement weather. It wasn’t raining anywhere we could tell but I guess they can’t be too careful with lighting striking all around us. We waited patiently but there were another two or three announcements about delays. There was no information about the duration of the delay – just an apology. Eventually, at 9:15pm, around twenty minutes after the show was scheduled to commence, Jennifer and I decided to cut our losses. Jennifer was already getting very tired as well. We made it through the throng back to the park entrance and onto the next ferry for the trip across the lake to the transportation hub. The ferry was about half way across the lake when we head some loud bangs. The light and fireworks show had begun. Bloody timing! Even though we were on the bottom deck of the ferry, we were on the side, so we managed to get some decent views of the distant fireworks all reflecting beautifully over the lake. The ferry docked, and we stood over to one side of the harbour to get an unimpeded view of the show. Just as we thought the show was over, we turned off our cameras and started walking towards the tram. Then, the fireworks kicked off again and we quickly stopped and whipped out the cameras again. Indeed, this happened no less than four times before the show did finally end. We took the tram to the car park, where we found Sandy and Joey, who had enjoyed the show from a distance from the comfort of the air-conditioned car. The brief ride back to the house included a quick detour to a MacDonald’s, so the kids could each have a dollar burger. Back home, the usual bedtime routine kicked in and we were all very soon settled for the night. Tomorrow is going to be a water park day. We plan to spend the day at Typhoon Lagoon with Andy, Kirsty and their two girls.